Instant messaging platform Line has launched an unsend feature for messages that were sent within 24 hours. In October, WhatsApp added the ability for users to unsend messages that they had sent by mistake. Now, one of its competitors – Line – is doing the same, although Line gives you 24 hours to react, and not just the seven minutes WhatsApp allows. This development certainly helps give its users “peace of mind,” that whatever they have sent doesn’t really have to be final. WhatsApp also has some other limitations – i.e you can’t take back something that’s been read. Line now also has an unsend feature. But it gives you 24 hours instead of WhatsApp’s seven minutes. 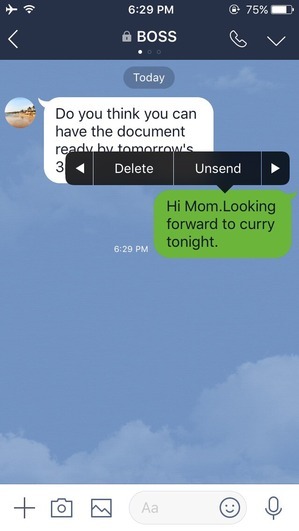 Line’s unsend feature can be used across chat types — in one-to-one conversations and group chats as well. Within 24 hours you can delete stickers, images, URLs, Line Music links, location information, files, call histories, as well as text and voice messages. The one thing that you cannot delete, are smartphone OS notifications. Also, if you thought you’d get off scot-free, you can forget about that right now. A notification will appear in the chat, showing that something was deleted. Both mobile and desktop versions of the platform support the unsend feature, except the Google Chrome version. Users of that version need to use a different device to unsend. Any more caveats? Yes. 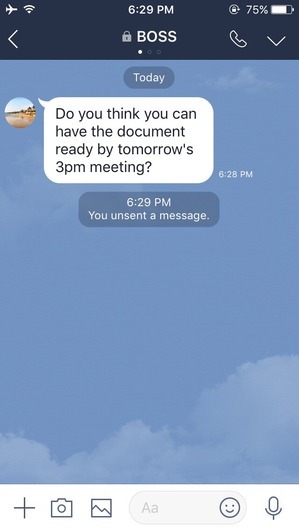 All members in a conversation need to have the latest updated version of Line for unsend to work. Sounds just like WhatsApp, right? The feature is easy to use – simply press on a message – or right-click it – and choose “unsend.” That’s it. A caveat to Line’s “unsend” feature? Yes, all parties need the updated version of the app.